Now that you have learned about the Graston Technique, and proven ways to incorporate Graston into your practice. In summary, the Graston Technique may be more effective than traditional methods in treating myofascial trigger points, increasing blood flow to an area, increasing muscular flexibility/decreasing fascial tightness, and decreasing ankle instability, along with other various ailments and conditions. 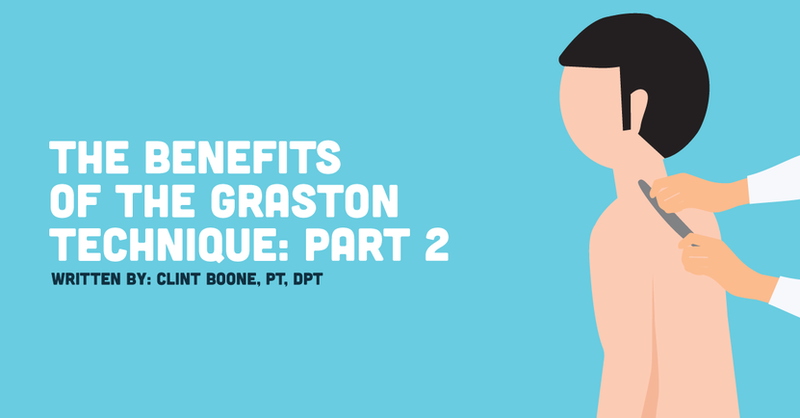 So now that you’re convinced, what steps should you take to start incorporating Graston into your practice? As stated in Part 1, there are two Graston Courses, M1 and M2. M1 covers the basics. M2 is more advanced. In the M2 course, Graston is performed in functional and/or sport-specific positions. Throughout my M1 course, I was told M2 is “where the magic happens.” In a recent change, those who complete Graston M2 training can go on to earn their Graston Technique therapy specialist (GTS) credential. However, you only need to take the M1 course to begin treating patients with the GT instruments. You do not need the tools to take the class, but you will need the tools to work on your patients. Many clinics and companies will offer to buy the tools out of their own pocket for the clinic, so ask your employer! It may help to explain to your employer the benefits and potential uses of the Graston Technique as well as the evidence-based research supporting the use of the Graston Technique for various conditions (as you will see below). Patients may be apprehensive to the Graston Technique at first. As stated in Part 1, patient education is key! Be sure to inform your patient that post-treatment redness and bruising is possible. If you warn your patients beforehand, they will be more willing to try the Graston Technique in the future. If you do not, some patients may believe their body simply cannot handle the Graston Technique and will defer all future Graston treatments in the future. There are questionnaires, informed consent forms, and waivers available. For a patient new to Graston, I start by showing the patient the tools and also letting them feel the tools if they desire. I explain that the process may be sore and tender, but should not elicit unbearable pain. I tell patients that I will “scan” the area with bigger tools that cover more surface area, and then individually treat areas with a smaller tool - one that covers less surface area but is more intense. Typically, I use a light-to-medium intensity level in the first Graston session, as patients will be most likely to bruise and/or be sore after the first session. If the first session is tolerated well, I will increase the intensity with subsequent Graston sessions. As stated in Part 1, I tell patients that this technique is usually performed with at least a 48-hour gap between sessions, to allow for healing of the tissues and to avoid excessive trauma to the area. Watch your patient satisfaction and compliance rate rise! After a few months of incorporating Graston in your practice, it is common to have repeat clients — or their friends or family — call to specifically request you and the Graston Technique. In my personal experience, 95%+ of patients who try the Graston Technique once will want to have it performed at subsequent physical therapy sessions. Many will admit that the Graston Technique “does not feel good” while it is being performed, but that it “feels like it’s breaking up something that needs to be broken up.” Although it does not feel “good,” many patients will realize the benefits of the Graston Technique. After completing the M1 Graston course, you can be listed as a “Preferred Provider” on the Graston website. You will also receive marketing and clinical materials from the company. Also be sure to update your LinkedIn or business cards to show you are “Graston Trained” after completing M1 or “Graston Certified” after completing M2. Additionally, you can go on to earn the newly established Graston Technique therapy specialist (GTS) credential. As doctors in your area become aware that you can Graston trained or certified, they may start sending referrals with your name on it requesting the Graston Technique for their patients. As you can see, there are droves of evidence-based articles supporting the effectiveness of the Graston Technique. In short, the Graston Technique can help patients achieve more optimal outcomes. I hope this article and Part 1 of this series have shown you the benefits of the Graston Technique and reasons why it may be worth incorporating in your practice!